or should you read your rights to them? Special guest appearances: Patrick Henry, and The Cartridge Family Band! includes artillery pieces and crew-fired weapons, amazing stuff, bargains too. My standard email signature has for a long while featured a quote that, while meaningful to me, may be mis-attributed, and has now been changed. According to Wikiquotes, itself a less than perfect source, "One man with courage is a majority," may not have been coined by Thomas Jefferson, as I've been posting. The quote has been "attributed to Andrew Jackson by Robert F. Kennedy in his foreword to the 'Young Readers Memorial Edition' of John F. Kenenedy's Profiles in Courage, and by Ronald Reagan in nominating Robert Bork to the US Supreme Court, but this has never been found in Jackson's writings, and there is no record of him having declared it." I've changed my signature to include a quote well attributed to Abraham Lincoln, which I use in conversation frequently: "Public sentiment is everything. With public sentiment, nothing can fail. Without it, nothing can succeed." This neatly expresses why I prefer to work in the court of popular opinion. We'll be taking action, those wheels grind slowly, stay tuned! right into a police voice recorder -- all for an innocent act of self defense. solutions are proposed, this self-defense loophole requires national attention and deserves your support. Could the "Adnarim Statement" help protect innocent crime victims? For 40 years, ever since the famous "Miranda" case at the U.S. Supreme Court, police have been reading people their rights when they are taken into custody under suspicion of having committed a crime. In a free society, does it make sense for the state to read you your rights? Is it possible that you should instead read your rights to the state? This controversial idea, endorsed by many attorneys, is proposed and explored in a new book on self defense, "After You Shoot: Your gun's hot. The perp's not. Now what?" 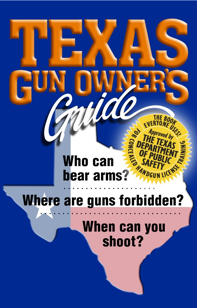 The book has been released by Arizona-based Bloomfield Press, the nation's largest publisher and distributor of gun-law books. More than 70 experts were involved in the creation of the book. "Many lawyers put statements on the backs of their business cards, designed to be read to police if you are stopped for anything from a traffic violation to a possible murder charge after a self-defense incident," notes Alan Korwin, author of this, his 13th book. "Is that a get-out-of-jail-free card, as some lawyers think? Or is it a go-directly-to-jail card, as others insist? We broke new ground taking a hard look at this issue." The idea of reading your rights to "the man" is not without precedent. To some degree, this is what happens when a lawyer is present to help a client while police conduct an interrogation. Korwin's proposed "Adnarim Statements," (Miranda backwards, pronounced ad-NAH-rim) are synthesized from numerous sources, and are actually three separate statements. The longest is potentially used on the back of a defense-attorney's card, reflecting what many lawyers currently do. The second is designed to be used by a defense attorney when phoning a report to 911, while rushing to the scene on behalf of a client-victim after an assault. The third Adnarim Statement, a mere four words, is intended for a person who must call 911 directly to summon aid, establishing that the caller is the victim and helping to ensure protection against self-incrimination. The Adnarim Statement approach is one of five proposed remedies for dangerous self-defense loopholes that put innocent people at risk after surviving assaults by criminals. Too often, innocent people unintentionally incriminate themselves, instead of being legitimately convicted on reasonable grounds by solid police work. Single copies of After You Shoot are only $14.95. 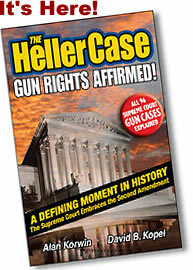 Review copies of After You Shoot for the news media are free on request, call 1-800-707-4020. Twenty-term congressman Charlie Rangel received serious ethical censure from his fellow members of Congress. Representing the historic New York area known as Harlem, and recently re-elected despite the ethics charges, the 40-year veteran will not be expelled from Congress, which would have been the most harsh penalty he faced. Proving once again that the so-called justice system is stacked to favor the ruling elite, a proven long-term crook will not be arrested or jailed, because he is well-connected member of Congress. Any member of the public caught hiding income and failing to pay taxes, especially over an extended period of time and in at least high six-figure amounts, as Rangel did, would face loss of assets and long prison terms. Rangel, who represents and has basically failed to improve the historic poverty-stricken festering pesthole known as Harlem for more than 40 years, received a public slap on the wrist. At least, say his critics, he had $2 million dollars sucked out of him by lawyers who failed to get him off completely. The money actually belonged to his contributors, for use in campaigns, so he really didn't lose anything, unless he had plans to spend the money on himself, which is unknown. In late breaking news, Rangel is now seeking to have his sentence reduced. The sentence amounts to being publicly confronted on the floor of Congress with his violations. He seeks to have the charges presented without having to stand there and listen to them. No actual punishment like prison or fines are involved. White House drug czar Gil Kerlikowske's update on counternarcotics efforts says smuggling arrests, narcotics seizures and cash confiscations all saw dramatic increases during 2009 and 2010 because of added manpower, fencing and technology on the border. "Our stats distinguish the facts from the popular frenzy of fabrication and falsehoods about the border," U.S. Attorney Dennis Burke said. "We have made inroads into Mexico through joint investigations and prosecutions as we have never before." But some Arizona officials question the numbers and claims of improved security: "We have not seen this improvement," said Pinal County Sheriff Paul Babeu, noting that his jurisdiction has become a major smuggling corridor. "They're not looking at the reality on the ground." Attorney General Terry Goddard said border enforcement was so weak for so long that recent efforts are only a start. "As compared to nothing, they're doing a lot," he said. Drug-fighting efforts will be bolstered this year by $600 million more in funding. [This is the 40th year in a row that funding has been increased]. Ethan Nadelmann, director of the Drug Policy Alliance, which advocates drug treatment and education rather than expansion of America's so-called war on drugs, said increased seizures and arrests don't mean that narcotics abuse or violence are abating. "It says to me they are responding to public demands, public fears," Nadelmann said. "This sounds like the same-old-same-old they've been saying for 40 years." State-issued propaganda released this week to U.S. “news” agencies was intended to show a winning trend in the seemingly endless war on some drugs. But inadvertently it shows instead that drug-war reports merely feature changing levels of federal activity, and do not measure drug activity in any way. The Uninvited Ombudsman has been saying for years that the war on some drugs is a total failure or even a well-orchestrated farce, a federal jobs program, and does little but provide feel-good law-and-order stories, price supports and bloody excitement for the traffickers, and enhanced sales and viewership for news-starved “news” media outlets. Recent praise for the discovery of a drug tunnel from Tijuana to San Diego lauded the capture of several tons of pot still in the tunnel. No information was provided on how much the tunnel was designed to handle daily, or how long the tunnel was in operation before it was discovered and reported like a Keystone Kops comedy. Many in the gullible brainwashed public saw the report as a victory, even though the tunnel featured a rail system, electric lighting and ventilation for an unknown length of time. News of the law-enforcement failure and massive easy imports prior to the discovery was not reported in the “news,” increasing the pseudo-credibility gullible news consumers have come to rely upon. The total number of drug tunnels in regular operation daily is not known. Critics complain that there is no way to know, so it's unfair to blame officials for their failures. The lame-duck Congress could enact bad laws that a non-lame-duck Congress would never attempt. Because there are so many lame ducks seated, the harm they could do to the nation is great. The lame ducks might even enact laws they couldn't get through before the election, since they have nothing more to lose. The discriminatory and derogatory "lame-duck" insult to ducks everywhere, by the lameduck media, should be ended, according to leading witnesses speaking on condition of anonymity from unidentified duck blinds. The promoters of this awfully lame slur should be ashamed of themselves, they say. The correct term is “lame politician.” Congress will have a lame-politician session before Christmas, making an already nervous public even more fearful of the harm the lame politicians might create. Ducks Unlimited has not been asked for comment, and has made none. Ducks Unltd. is an animal civil-rights group involved in caring for and feeding ducks -- to hunters and their families. The Brady Campaign to Prevent Gun Violence released its annual report card, scoring the states on their efforts at gun control. We in the media faithfully report the results, rooting for high scores for all states, to ensure a planet full of control and free from crime. People who understand such things look down and frown upon states that get low Brady scores, where any cretin with one eyebrow and an NRA card can buy an arsenal of deadly assault revolvers and many many bullets. Arizona, which leads the nation in a handful of social issues, is now seeking a first-ever negative score from the group formerly known as the Brady Campaign to Ban Handguns. Currently, the Grand Canyon state is ranked at 2 out of a possible 100 on the Brady annual report card. Apparently, all two points are awarded due to the ban on campus carry, which prevents anyone on a college campus from legally exercising the Second Amendment of the Bill of Rights. Even tenured professors with FBI clearance and plastic-coated government permission slips suffer under the ban. An effort to overturn that ban is being fought on principled grounds, according to AzCDL. The improvement in the Brady score is just a bonus. “We want zero!” was a chant at the group's annual open-carry banquet, which attracted 400 armed diners. Service was slow, but all the waiters made it out alive, contrary to critics' fears. Nothing, although they did cover much smaller donations for everything from studying bugs to (name something silly here, so many to choose from). In other news, the National Shooting Sports Foundation, which owns and operates the colossal Shooting, Hunting and Outdoor Trade Show each year (The SHOT Show) has analyzed the FBI released National Instant Criminal Background Check System (NICS) figures for August 2010. NSSF-adjusted figures (718,971) show a 4.6 percent increase over August of last year (687,252). The adjusted NICS data were derived by NSSF by subtracting out NICS "purpose-code" permit checks used by several states such as Kentucky and Utah for CCW permit application checks, as well as checks on active CCW permit databases. Polls like this are nonsense on their face, since even the members of Congress who signed the gigantic bill don't know what's in it. Asking people what they think of something they know nothing about is scandalous just on logical grounds. Reporting about a bogus and manipulative propaganda effort like this might have merit. Using it as a news story, to provide support for a politician's waning popularity, is as serious an ethical breech as flat out lying. The all-too-common reporter excuse that, "I accurately reported what the survey said," is no excuse and just adds to the embarrassing humiliation that has become U.S. "news." It's not known if the reporter helping to perpetrate the hoax was aware of how bad this is, or if he was duped just like his readers. It was not known at press time if any of the survey respondents could name even a dozen of the hundreds of provisions in the massive bill they say they like, or describe even a single item in it with any degree of accuracy. Ex-White House Advisor to Speak at ASU: A controversial former advisor with the White House Council of Environmental Quality will speak on Thursday as part of ASU's Global Institute of Sustainability Wrigley Lecture Series. "I can't tell you how many students have told me, 'he is my hero,' " said Lauren Kuby, manager of events and community engagement for the institute. "He has made sustainability not about just changing your light bulbs ... it is a movement that can really create jobs." The event is co-sponsored by ASU's Undergraduate Student Government, which has been working on bringing the speaker to the campus since summer, said Tina Mounlavongsy, student government vice president of services. "We thought this would be a great event and we have gotten a lot of positive feedback so far from students," she said. Van Jones, the disgraced self-avowed communist who was thrown out of Mr. Obama's White House under suspicious circumstances, was invited to speak at Arizona's largest state-sponsored university, with students and teachers alike naively cheering his arrival. No mention of his sordid anti-American past was evident in the publicity for the event. Hired to serve as a czar (the green czar) under Obama was poetic, since the convicted felon had "formed a socialist collective which championed the ideas of Marx and Lenin, and seized on the environmentalist movement as a vehicle for his extremist ideas," according to published reports. ASU, proud of its school of sustainability, has failed to recognize that nothing is sustainable, because everything is consumptive. The laws of thermodynamics, which describe the nature of the universe, make it clear that since energy is always lost to any closed system, the very idea that something can be sustainable is impossible. It was not known at press time if the new ASU green school talks with the physics department. In other news, great praise has been heaped on the "zero-emissions road race," an automobile race featuring totally electric cars. Missing from the reports is any mention that the "emissionless" cars need to be recharged, and that this is done by burning fuel that has to be mined and processed at great expense in energy, cost and emissions, so that some of the energy can be used to produce steam, so that some of the steam energy can turn a turbine, so that some of the physical motion can be turned into electricity, so that some of the electricity can be sent down transmission lines, so that some of it can be fed into the battery of the vehicle-that-has-zero-emissions-if-you-don't-look-past-its-accelerator-pedal. Because the laws of physics (that is, the nature of the universe) show that energy is lost every time there is a conversion process, it is not clear if burning fuel directly in a car engine would yield lower emissions than that long process what I just said before. Read this carefully -- it will be a great help to my work, and excellent for you. I have a video to share with you that sums up why every couple in America should be armed. If every responsible citizen had Front Sight's training, a 30-state CCW permit and a gun, crime would plummet to a level never seen before. I'll do my part to make it happen. Will you do yours? Watch this video and you will understand WHY I am willing to put my money where my mouth is and provide a FREE, Springfield Armory XD Pistol, plus a 30-state Concealed Carry Permit and 2 for 1 "Carry a Gun" Lifetime Membership for pennies-on-the-dollar. I want every couple in America to CARRY A GUN and have skills that exceed law enforcement and military standards! I have a 2 for 1 "Carry a Handgun" Lifetime Membership for pennies-on-the dollar and a FREE, Springfield Armory XD Pistol, plus all the tactical gear needed so there is absolutely no reason why you and your spouse cannot be just like the couple in the video. The choice is yours. Plus -- For every person who decides to act on this offer, Front Sight will make a donation to the work that Alan Korwin does with Bloomfield Press and his Page Nine reports! Again, here is your ticket to a lifetime of training, a gun, and the ability to carry discreetly in 30 states. You help yourself, your community, and Mr. Korwin -- three worthwhile goals! Don't hesitate as the free guns and bonus lifetime memberships are already going fast and will be gone soon. I look forward to Front Sight providing you and your entire family with the Comfort of Skill at Arms! Works for anyone in any state -- an excellent stocking stuffer! 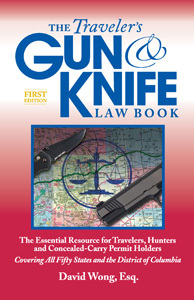 Brand new and five times thicker than the original Traveler's Guide (which is still an excellent resource), the new book covers guns AND knives, restaurant carry, park carry, your rights in a traffic stop, do you have to notify officers, much more, with tremendous detail you could not get before! Get 'em both! 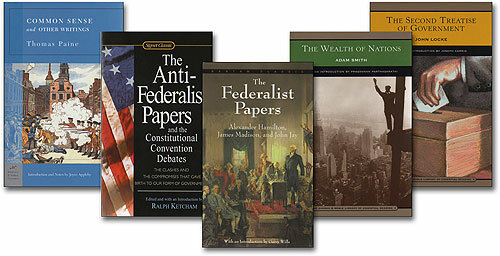 Every American home should have the books our Founding Fathers read and wrote. Get the 11 top titles with one easy decision. 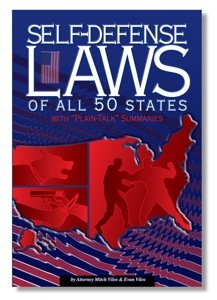 Visit this page for clear detailed summaries of these all-time classics and you won't even need to get the set.